Public procurement plays a pivotal role in the economic development of any country. In Kenya, it is the means through which government spends revenue raised annually, for the implementation of public service delivery. As such, a public procurement system that is economically inefficient invariably undermines the government programs for economic growth. However, the scourge of corruption in public procurement for a long time has bedeviled Kenya. The problem has passed on from one government to the next but no serious effort has been put in place to fighting the vice. This study sought to examine the causes, consequences, challenges and cures of corruption in public procurement in Kenya. Broken Windows Theory of International Corruption and The Ethical Theory guided the study. The study used a desk study review methodology where relevant empirical literature was reviewed to identify main themes. A critical review of empirical literature was conducted to establish the causes, consequences, challenges and cures of corruption in public procurement in Kenya. The study concluded that a range of economic, political, administrative, social and cultural factors, both domestic and international in nature, characterizes causes of corruption in public procurement. The study recommended on adoption of open contracting principles and data standard, transparency and fairness in access to information on public procurement. The Government should implement stiff penalties for breaches to procurement requirements and capacity strengthening of procurement practitioners on adherence to procurement regulations. There is need for instituting proper records management tools for public procuring entities and more robust mechanisms should be implemented in e-procurement to enhance its functionalities at all the stages of the public procurement cycle. Lastly, government should place more investments in enhancing the capacities of internal audit processes within Ministries, Departments and Agencies. Keywords: Corruption, Public Procurement & Kenya. Authority, P. P. O. (2016). Assessment of the procurement system in Kenya. Nairobi: PPOA. Authority, P. P. O. (2017). Assessment of the procurement system in Kenya. Nairobi: PPOA. Burbidge, D. (2016). The shadow of Kenyan democracy: Widespread expectations of widespread corruption. Routledge. Compact, U. G. (2016). Fighting corruption in the supply chain: A guide for customers and suppliers. UNITED NATIONS, New York. D'Arcy, M., & Cornell, A. (2016). Devolution and corruption in Kenya: Everyone's turn to eat?. African Affairs, 115(459), 246-273. Ethics and Anti-Corruption Commission (2015). An Evaluation of Corruption in Public Procurement; A Kenyan Experience. Institute of Economic Affairs (2018). Public Procurement In Kenya: Analysis of the Auditor General’s Reports. Journal of Public Procurement (2017). The Effects of Fraudulent Procurement Practices on Public Procurement Performance. Kenya Ethics & Anti-Corruption Commission (EACC): Country Public Officers’ Experiences 2017. Muange, E., & Chirchir, M. (2016). Procurement Legislation and Performance of Constituency Development Fund Committees in Kenya. 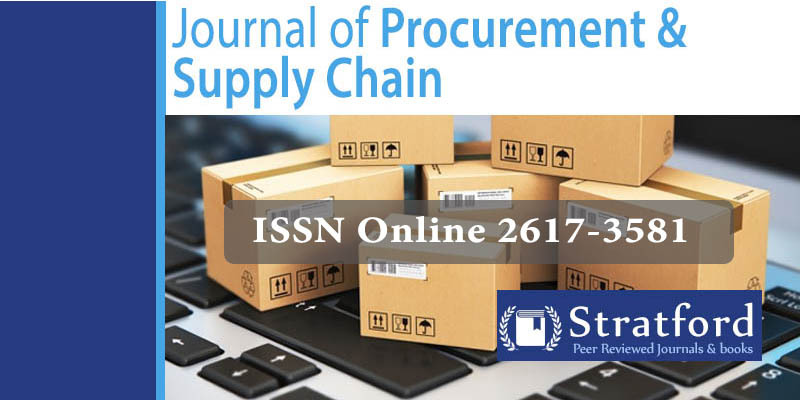 International Journal of Supply Chain Management, 1(1), 19-33. Odhiambo, F. O. (2015). Determinants of corruption in Kenya: Born and bred to bribe. PricewaterhouseCoopers, S. (2017). Ecofys (2009): Collection of statistical information on Green Public Procurement in Africa. Report on data collection results. PricewaterhouseCoopers: Global Economic Crime Survey: Kenya Report 2016. Transparency International Kenya (2017) ‘Bribes demanded by regulatory authorities contribute to increased cost of doing business. Transparency International: East African Bribery Index- Kenya 2016. Transparency International: Global Corruption Barometer – People and Corruption Africa Survey 2016. Weeks, M. P., & Namusonge, G. S. (2016). Influence of information technology practices in procurement on organization performance in public institutions in Kenya. International Journal of Economics, Commerce and Management, 4(5).